On April 29, 2016, the United States stock market officially entered second longest bull market ever. It’s only surpassed by thirteen year bull run from 1987-2000. During bull markets, spirits are high and investors tend to get a cocky. Everyone feels like a genius during a bull market. If you’re a DIY investor with a rising portfolio value, it’s easy to get sucked into a grow at all costs mentality. But during this bull market, we recommend showing your true genius by reassessing your investing strategy in three key areas. Bull markets tempt investors to take on risk, so it’s important to keep an eye on your risk in addition to your returns. At DIY.Fund, we advocate that portfolio owners should take a look at risk adjusted returns. You must take on risk to see returns, but your returns may not be in line with your portfolio risk. The upward momentum of the stock market often blinds investors to risk. It’s easy for investors to feel like they’ve outsmarted the market when they’ve really just taken on too much risk. Don’t be fooled by the bull run. Assess your risk, and adjust your portfolio to align your risk and returns. During a bull run, certain stocks and certain sectors tend to drive performance. It’s easy to get overweighted in one sector without realizing it. Oftentimes being overweight in a particular sector comes as a result of a single stock performing particularly well relative to the market as a whole. It is painful to “sell the performers”, but it’s important to keep your sector allocation in check. If you need some convincing around this point, just check out this sector performance chart. You can see that the average difference between the best performing sector and the worst performing sector has been more 30%. 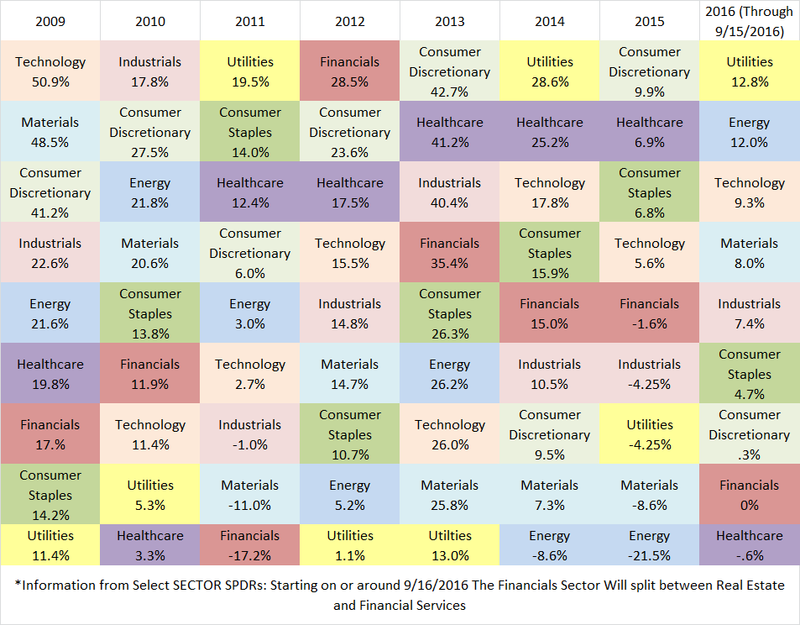 During the time selected, no sector repeated as a top performer for two years in a row. If you’ve never taken the time to consider sector allocation in your portfolio construction, take some time to analyze your portfolio. Decide on an allocation that fits with your goals, and stick to it. Over the past seven years, most investors have seen tremendous returns. Is the bull market it’s easy to mistake high returns for clairvoyance. No investor can control the market. It’s difficult to predict whether the overall market will go up and down. Likewise, it’s impossible to say exactly how much your portfolio will be worth one day or one year from now. Instead of focusing on what you can’t control, focus on what you can control. You can control the composition of your portfolio, and you can control your strategy. However, you cannot control the market. Remember what you can control, and investing prowess will follow. It’s tempting to believe you’re a genius in a bull market, but it’s better to rely on sound portfolio construction.